Deanfield Homes has been granted planning permission for its latest development in the Oxfordshire village of Shipton under Wychwood. The site, Deanfield Grange, will feature 44, three-, four- and five-bedroom family homes, built in a traditional style with a high specification. Pictured is the four-bedroom detached Elstow, which will be available at the development. 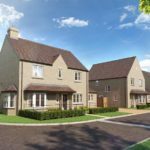 Peter Blades, Managing Director of Deanfield Homes commented: “We are delighted to be bringing another development to Oxfordshire, on the back of the success at Deanfield Meadow in Ducklington and our new development, Deanfield Grove in Tackley. “As a company we are pride ourselves on creating homes in environments that have a real sense of place and this latest development will be no exception. Shipton under Wychwood is an extremely sought after picturesque Cotswold village located in the beautiful Evenlode Valley. Work is due to start on site in early Spring with the show home expected to launch in the Autumn.